As she walks, Morula’s ears slap flatly against her shoulders, Whoooosh, thwack . . . Whoooosh, thwack . . . Whooosh, thwack . . . Elephant air-conditioning. Morula produces enough heat to warm a small house. She is also pachy-dermed, thick-skinned. Some of her blood vessels are as deep as one-and-a-half inches under her skin’s surface. Since she doesn’t have sweat glands, her ears act like giant heat exchangers, regulating her body temperature. 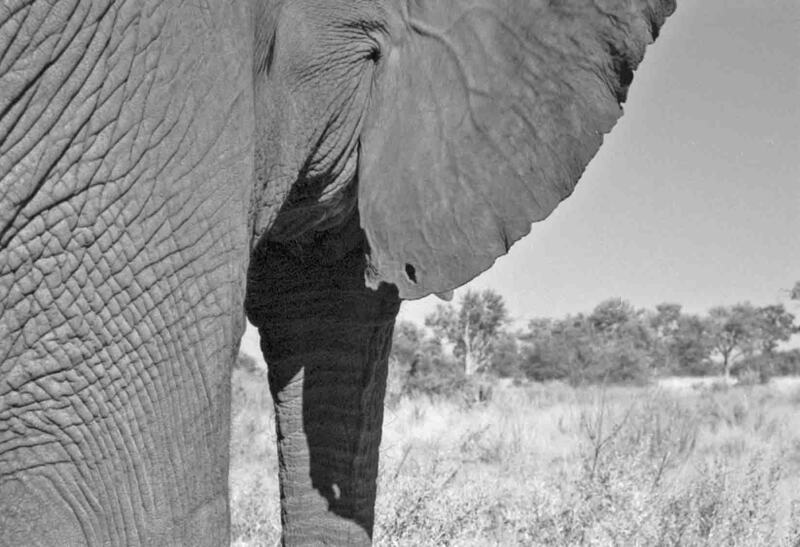 As air moves over the huge network of swollen arteries covering each ear, Morula’s blood cools as much as nine degrees before it returns to her body. When spread open, her ears increase her body size by roughly twenty square feet, a huge area for the process of thermoregulation. I take a photograph of her ear in mid-flap. Where Morula’s ear attaches to her shoulder, wrinkles give way to swollen arteries pumping five gallons of blood per minute across the surface of her ears. The pattern of those arteries is as unique as a fingerprint and often used to identify individual elephants. I think you’d be woeful if you did have ears as big as Morula’s are! Thanks for reading this post.